Okay, my friend Rebecca (Crazy Rebecca on Ravelry and Etsy) has challenged herself to post a picture daily for 365 days... or maybe it is 365 pictures. I don't know really. But ... doesn't it sound like fun! What can I possibly do but take up that gauntlet and see if I can keep up. So here goes for day one! Using an older picture because I did not charge up my camera batteries. 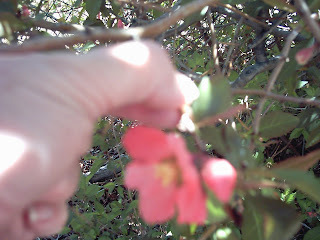 This one is a picture of the flowering quince at the street end of my driveway... why... well, it has been cold and yucky for most of the week. Not today though, today is beautiful and it promises to be lovely for a few more days too! Off to get that lecture taken and get my lab done. School can be a pain I think, but I like it.